[Editor’s Note] We are fortunate to live in the information age, where data can easily be accessed by a touch of a button. As preppers, we should use this to our advantage and this includes using our phones. The apps listed below could save a life – and that life could be yours. Whether you have a pre-existing condition or find yourself with a medical emergency, time is always of the essence. When it comes to a matter of life and death, you will want to have as much available help as possible. Thankfully, there are some excellent iPhone apps designed to help in medical emergencies. These 10 apps could save your life, so make sure to install them on your iPhone before it’s too late. Spot a Stroke F.A.S.T. – Packed with resources, including how to spot a stroke, a stroke symptoms video and much more, this free app is definitely a potential lifesaver. 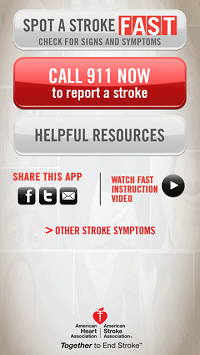 Developed in partnership with the American Stroke Association, Spot a Stroke F.A.S.T. is your first warning of trouble. All features are quickly accessed, meaning you don’t waste precious time before calling emergency medical services. SPOT Connect – If you ever become lost while hiking or camping, Spot Connect is one free app you will really appreciate. Even if you don’t have a signal, Spot Connect will allow you to send a predefined location message via text or email. The app uses satellites, so you can send Help, SPOT Assist and SOS messages that will supply your latitude and longitude, date, time stamp and a link to maps. First Aid – An app created with the American Red Cross, First Aid provides step-by-step guides to medical emergencies that you may face. All content is available offline, which means you’ll never have to worry about losing signal in an emergency. There is a built-in 911 feature, so you won’t even have to leave the app if the situation extends beyond your first aid capabilities. !Emergency! – No matter where you are in the world, you should always travel prepared for an emergency. !Emergency! costs $0.99, but it could save your life with quick access to emergency contacts, whether you are in Brazil, Australia or anywhere else. You don’t even have to perform any functions, simply launch the app and !Emergency! will provide you with all the contact information you need. SMART – ICE – If you find yourself in the middle of a medical emergency, SMART-ICE will do everything possible to save your life. With a quick press of a button, the app will send out a call to an EMS and an alarm will sound to help with location. There is also a feature that pinpoints your current location, so that you can provide the dispatcher with the information that they need. Once the EMS arrives, they can access all your medical information through the app via a personal recorded message. There are so many more features that come with this app, which makes the $0.99 well worth paying. IBREASTCHECK – This app provides women with all the information that they need to identify signs of breast cancer. iBreastCheck has a step-by-step guide, which details how to conduct checks for potential dangers that could be the first indicators of breast cancer. The app is absolutely free and is designed to help get women the treatment needed, should they discover a problem. FEMA – The Federal Emergency Management Agency has developed this app to provide a guide for any type of disaster. This free app will provide you with preparedness information, checklists and locations for disaster recovery and FEMA stations. So should a hurricane, earthquake or any other type of disaster strike, you’ll know exactly what you need to do. iTriage – Before your symptoms progress, find out what the possible cause and treatment is with iTriage. The free app was developed by two ER doctors, and contains thousands of detailed processes to help identify symptoms and causes for all your ailments. In addition, other features allow you to locate any doctor, medical or emergency service. Mole Detective 2 – Using the dermatologist ABCDE method, Mole Detective 2 analyzes your mole for signs of potential melanoma. You can also track the same mole, which will give you updates on whether the risk factor has increased. The app costs $4.99, however, this is only a testament to how high the risk of undetected skin cancer is all over the world. UPC Food Scanner – Some allergies are potentially life threatening, so as a sufferer watching what you eat is vitally important. UPC Food Scanner reads food labels and will tell you exactly what’s in the packet. There are 18 risk warnings, which include gluten, fish, milk, nuts, egg and shellfish. Ingredients are listed in alphabetical order for easy reference, and you can purchase the app for $0.99.